Happy Birthday, dear Olga! May your day be fantastic and be followed by many many more! I thank you for the great artworks you show us and the neverending energy to teach us so kindly how you created them. I can't think of any better teacher than you are, my dear friend! You are truly an inspiration for all of us! Artist Reply: Thank you for the beautiful comment on my work, Al! OLGA does not post anymore on AW, unfortunately has she has a tremendous talent, but I am sure she has been simply delighted to receive such a lovely birthday card. Anneke you did a perfect work!!!!! Artist Reply: Many many thanks for the sweet words, Marie-Claire! 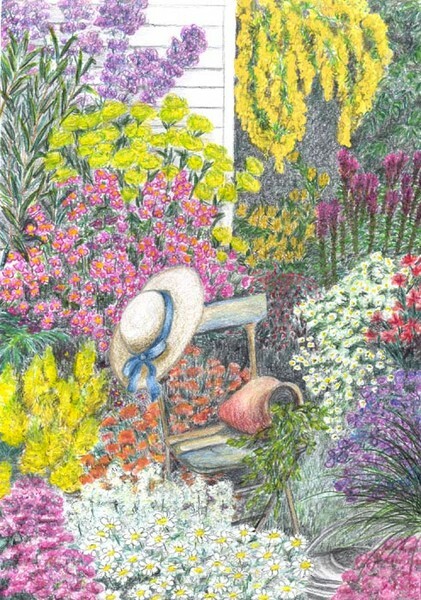 WHAT A VERY BEAUTIFUL SUMMER GARDEN AND MARVELOUS BIRTHDAY CARD YOU DID TO OLGA !!! CONGRATULATIONS ANNEKE !! Artist Reply: Thank you so much, Marie josé! Artist Reply: Thank you so much, Angel! Artist Reply: Thank you so much, Pamela!